Legends and lore of spiders are numerous and widespread, and many of these involve giant spiders, and human-spider hybrids. Spiders are spinners and weavers, and therefore often associated with the spinning of tales as well as webs. Here are a few of the trickster deities, monsters and cryptids from the fascinating world of arachnids. Anansi is a trickster creation deity in West African folklore, the son of Nyame the Ashanti sky-god and Asase Ya the earth-goddess. Kweku Anansi was punished by his father for his trickster antics and turned into a spider, though he he can still also appear as a man. He is known as the keeper of stories. Through his Web of Life, Anansi educates his people on construction and community. Anansi and his fables spread throughout the African diaspora to the Caribbean and America, where he is sometimes called Nanzi, Annancy or Aunt Nancy. An Anansi Story from Sesame Street: The Sun and the Moon, read by Ossie Davis. Hear stories of Anansi getting into trouble and learn more about his origins in the 1969 animated short film Anansi the Spider by Gerald McDermott. 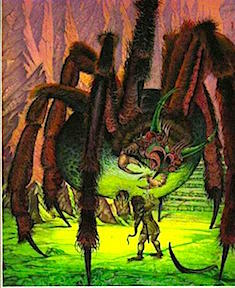 Aragog is an acromantula from J.K. Rowling’s Harry Potter stories. 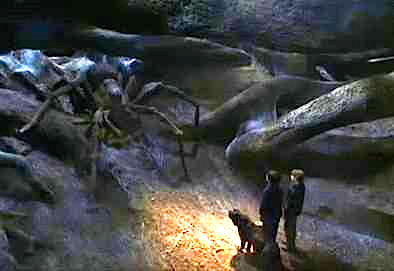 Aragog and his wife Mosag lived in the Forbidden Forest near Hogwart’s School of Witchcraft and Wizardry, where acromantula venom is employed as a rare and powerful potion ingredient. Aragog and Mosag had thousands of offspring, and although Aragog could be directed away from harming humans by his friend and protector, Hagrid, as Aragog aged his control over his colony of spider children lessened, making them a particular danger to young Hogwarts students. 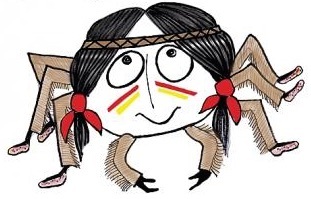 Iktomi the Spider is a trickster spirit from the Lakota/Sioux tradition. 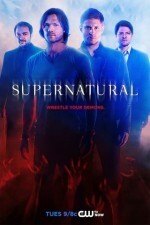 He is a shapeshifter who also enjoys acting as a puppetmaster to hapless humans. Coyote (Mica) is often his partner in troublemaking. Stories of Iktomi’s exploits act as cautionary tales for children. Other spider spirits in Native American folklore include the Spider Woman of the Hopi, and Grandmother Spider of the Cherokee. The Ojibwe dreamcatcher, with its web-like shape, is also grounded in stories of the Native American spider deities. 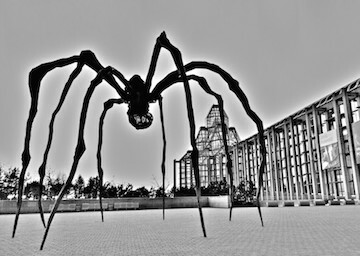 “Maman” sculpture of bronze and marble by Louise Joséphine Bourgeois, at the National Gallery in Ottawa, Canada. Also known as the Giant Congolese Spider, the J’ba Fofi is a cryptid of Equatorial Africa. It is said to be brown with a purple abdomen, and three-foot-long legs—making it an enormous spider indeed. Many accounts of the J’ba Fofi made their way to the Western world during the Belgian colonial occupation that began in the early years of the 20th century, but stories from early missionaries can be found as far back as the late 18th century. The Baka people of that region say that diminishing rainforest habitat has made sightings of the giant spider very rare in recent years, which is why to this day no photographs or specimens of this elusive creature exist. The Jorōgumo, or “whore-spider,” is a yōkai from the Edo period in Japanese folklore, often portrayed with the head and torso of a woman and the legs of a spider. But the Jorōgumo can also take on the appearance of a beautiful woman in order to lure and seduce samurai to her lair, where she binds them in her silk webbing and eats them. Along with the numerous books, anime, and games that contain Jorōgumo as characters, a Season 1 episode of Grimm features a Jorōgumo. Another spider-shaped yōkai is the Tsuchigumo, a Kyoto yōkai who eats travelers. The Tsuchigumo has the body of a tiger, legs of a spider, and the face of a demon, and is the titular character in a famous work of ancient Noh musical theater. The legendary giant spider Shelob resides in J.R.R. Tolkien‘s Middle-Earth. Shelob is an “evil thing in spider form … [the] last child of Ungoliant to trouble the unhappy world.” She is an ancient and deadly creature, preying on orcs, men, elves, dwarves, or whatever other unfortunate creatures wander into her great personal city of webs. She is even known to have eaten her own children. Unaffected by both the lure of the Rings of Power and the sway of the powerful Sauron, Shelob keeps her own counsel within the labyrinthine caves in the pass of Cirith Ungol. 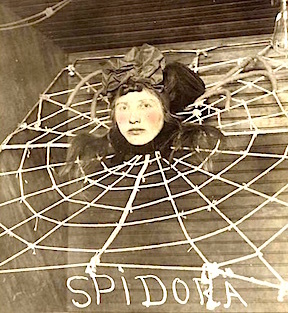 Spidora is a commonly used name for the spider girl of the carnival sideshow circuit, seen across America from the early 20th century to the present day. 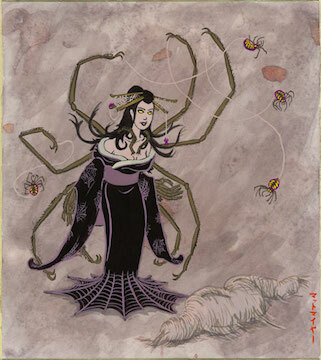 Spectators to the Spidora (sometimes also known as Arachnadia) sideshow would see the illusion of a woman’s head on a spider body atop a large web. Spidora is the star of a recent (2014) short film by Fred Olen Ray called Spidora: An Eight-legged Love Story. Do you have a favorite giant spider we haven’t mentioned, or a scary spider story to share? Tell us about it in the comments! Giant spiders! I will have nightmares tonight. Shelob is the scariest I think, but that Congelese spider is pretty scary too.